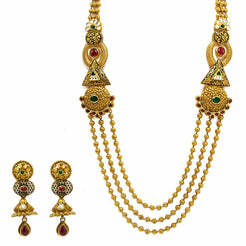 22K Yellow Gold Antique Temple Necklace W/ Ruby, Hanging Pearls & Mango Shaped Peacock Accents for women. 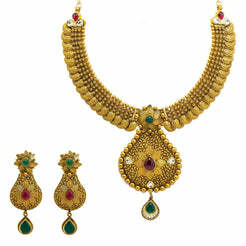 This beautiful antique piece features a large Laxmi pendant embellished with rubies and hanging pearls. It is 30" long with a width range of 2-14 mm. 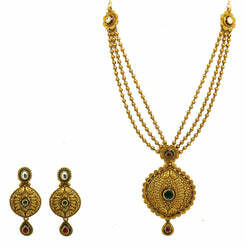 The pendant is 60 mm long and 50 mm wide. 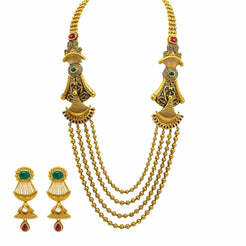 It weighs a total of 98.9 grams and can be worn to complete a classic and traditional look.